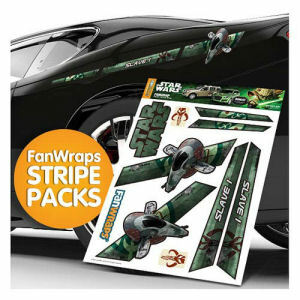 We have Just Sold out of Star Wars Slave I FanWraps Car Decal. Not to Worry! Fill in the Notify me When Available and you will be the first in line for our restock of Star Wars Slave I FanWraps Car Decal !! From the Star Wars collection by Fanwraps. Star Wars Slave I FanWraps Car Decal. Decal Measurements - Star Wars Logo measures 7 inches long by 3 inches tall - Bounty Hunter Symbols measure 2.5 inches tall by 1.5 inches wide- Slave 1 Ship measures 10 inches long by 6 inches wide - Slave 1 Green Bar Decal measures 13-inches long x 3-inches wide. Boba Fett Logo Green Bar measures 7 inches long by 1 inch wide.